The foundation is the concrete structure that supports your entire home. Soil conditions are inspected and verified on each homesite, and your Builder performs a quality inspection prior to pouring any concrete. 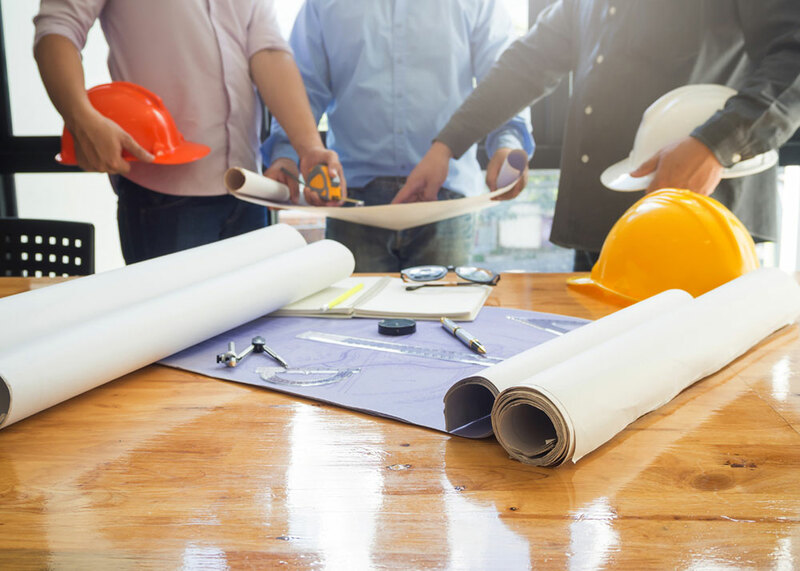 Once the municipal inspector has conducted their inspection and found the job to be in compliance with applicable building codes, the foundation is placed. The frame makes up the shell and skeleton of your home. It defines the interior room layouts, and along with the foundation, provides the structural integrity of the home. Framing may last several weeks. Once the exterior sheathing and roofing are installed and the home has been sufficiently completed to keep wind, rain, or other weather elements out, the rough mechanicals can begin. If the frame is the skeleton, then the rough mechanicals are the internal organs of your home. During this phase, air-conditioning, heating, ventilation, plumbing and electrical wiring are introduced to the structure. Siding and masonry may also begin during this period. If you’ve opted for any special security systems, central vacuum or pre-wiring for your stereo and entertainment centers, installation takes place at this point. The home is then ready for insulation and applicable municipal frame and mechanical inspections. This is the midway point of the building process! After drywall is installed in the interior of the structure, joint compound and texture are applied to complete the interior wall surfaces. 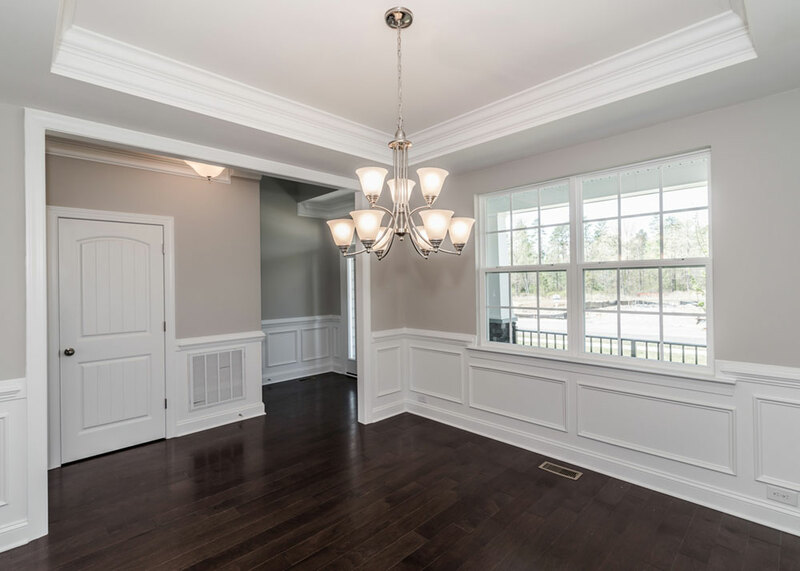 Interior wood trim is then installed and the entire home is painted. The driveway and walks are poured, and the yard is graded. All of these finishing touches will help your house begin to look like a home. The countertops and cabinets are then installed and resilient flooring or tile is laid in the kitchen and baths. Now the fun really starts! During this phase, you will begin to recognize the home you designed. The team installs faucets and sinks, light switches, towel bars, doorknobs and all of the small hardware items that you’ll be using on a daily basis. Outside, the landscaping is completed, adding to the excitement. Lastly, flooring is finally installed in the interest of protecting your carpet and hardwoods from boots, nails and dust. Any minor adjustments take place during this phase including drywall and paint touch-ups. 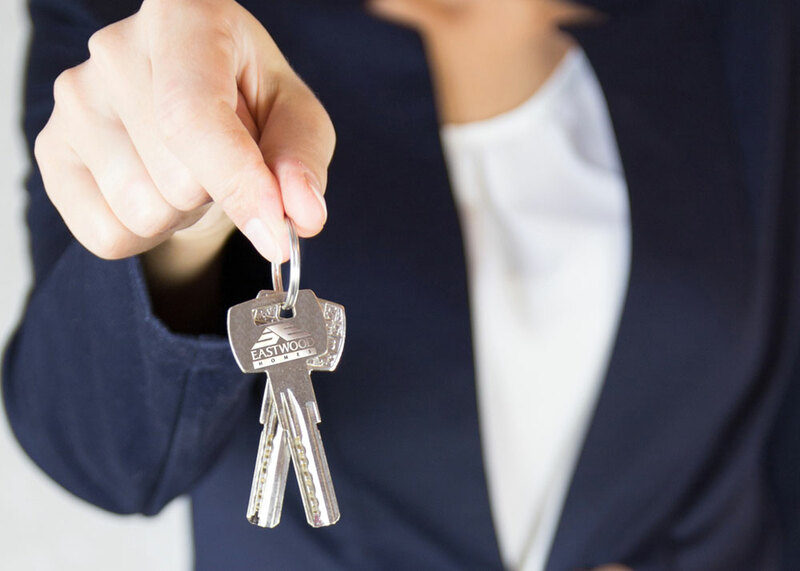 The home is given a thorough cleaning and is prepared for the final orientation before we hand over your keys! 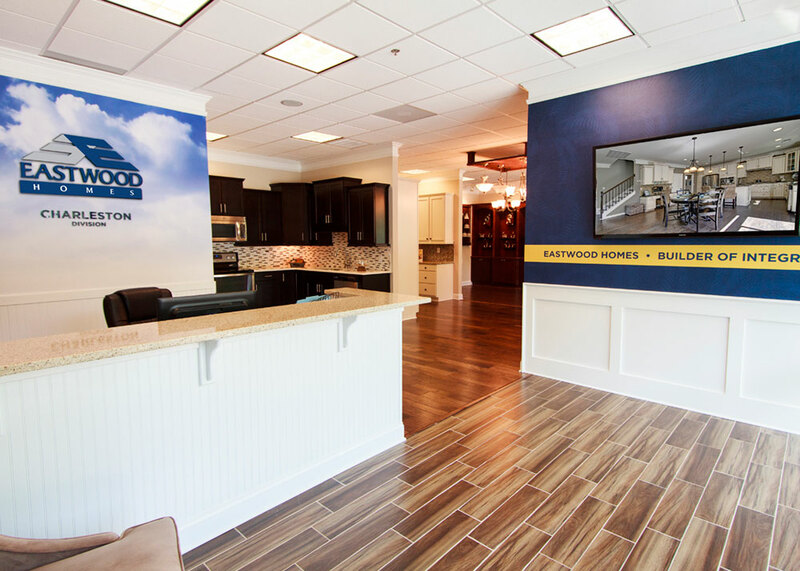 Every new Eastwood Home is tested and rated using the Home Energy Rating System Index, or HERS. Your new Eastwood Home will come with an Energy $avings Certificate indicating the annual cost and energy savings produced by the home. 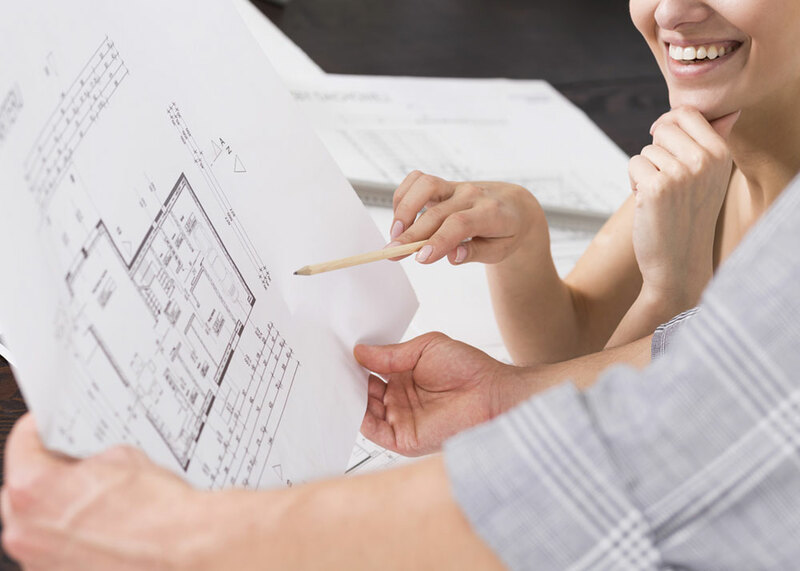 This value is calculated based on careful analysis of the home construction plans and detailed on-site inspections performed by RESNET, the Residential Service Network! Each one-point decrease in the HERS Index equates to a 1% reduction in energy consumption, so the lower the score, the more efficient your home is. Expect your new Eastwood Home to provide significant savings over many new other new homes and especially over homes built as little as 5 years ago! Sealed ducts help deliver conditioned air more effectively and permit the heating and cooling system to operate with less effort. Sealing a home's exterior helps reduce drafts, dust, and pollen. Properly installed insulation helps to reduce energy consumption, improve overall comfort, and minimize indoor temperature variability. Windows help save energy through the use of one or more advanced technologies, such as low-emissivity (low-e) coatings. Using local suppliers and recycled materials in construction to help reduce greenhouse gas emissions. Water-efficiency measures can reduce water and sewage costs by up to 30%. The engineering of low-flow faucets, shower heads, and toilets reduces water usage. The environmental benefits include increased water supply to local streams, wetlands, and their natural inhabitants. With the help of independent Home Energy Raters, we choose the most appropriate energy-saving features for our homes. 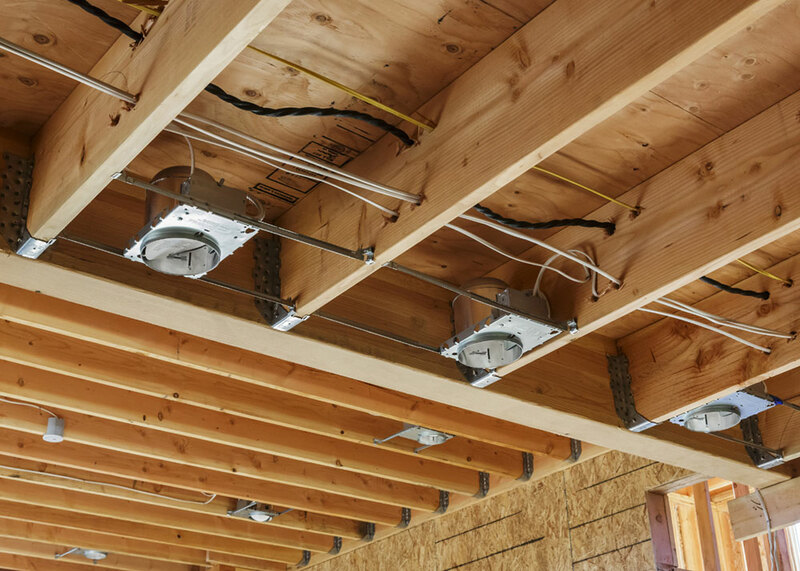 Additionally, raters conduct on site testing and inspections of all homes to verify the energy efficient measures, as well as insulation, air tightness and duct sealing details. The diagram below represents the air flow within your home. It's important your builder understand this flow to prevent air leakage within the home. 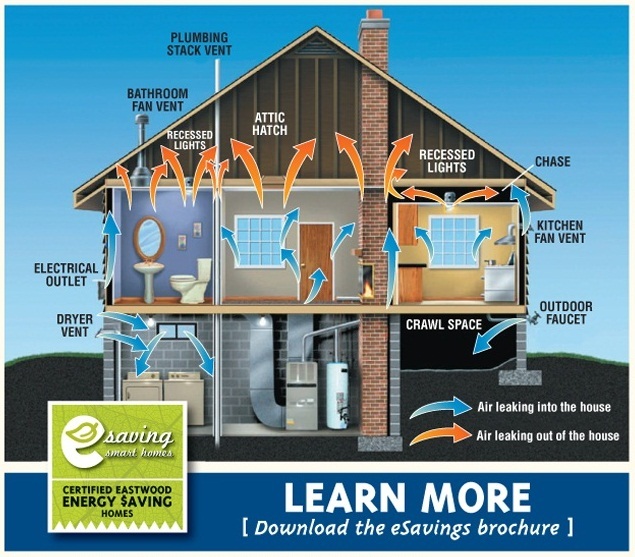 After all, air leaking in or out of your home can greatly affect your energy bills! 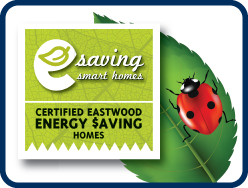 To learn about Eastwood Homes Energy $avings, Download our E-Savings Brochure or visit one of our communities. Our New Home Specialist would be happy to speak to you in further detail! 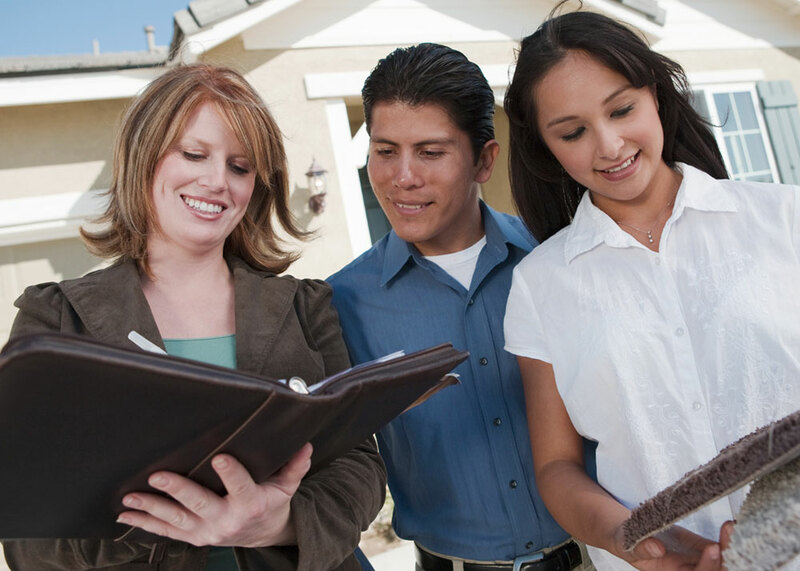 We want to offer you the best options when it comes to financing your new home. Financing solutions are endless with our lender partners! Eastwood Homes works exclusively with lenders with whom we place our trust to offer flexible options to suit nearly every scenario. We will work with you to find the best option available for your particular situation. In some cases, 100% financing is available for those who qualify. 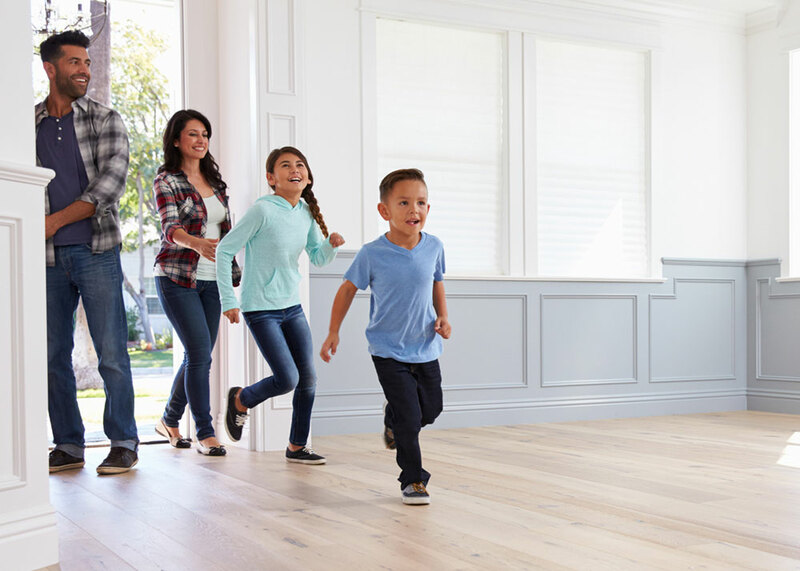 The first and most important step to take when deciding to purchase a home of your own is to get prequalified for a home loan. 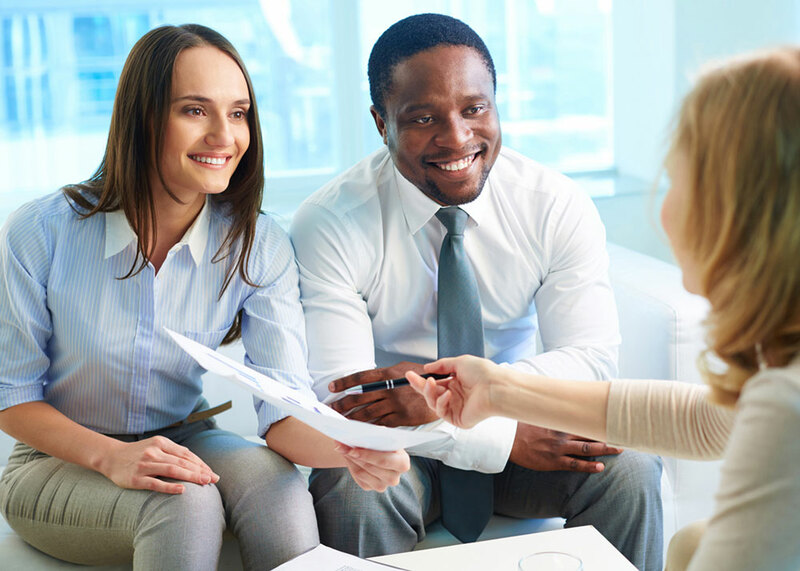 Our trusted Mortgage Partners will help to guide you through the process of obtaining a mortgage, but it all starts with the Prequalification. Find out what buying power you have by filling out our easy online form!